The Bahamas Technical and Vocational Institution (BTVI) was recently recognized as an authorized educational partner of TestOut Corporation for its commitment to improving the lives of students. TestOut provides industry-leading Information Technology (IT) certification training through interactive, hands-on lab exercises, video training, written lessons, quizzes, and certification exams - all in one integrated training package. BTVI has been using the virtual testing software for over five years, giving students cutting edge methods to gain external, international certifications such as the Computing Technology Industry Association (CompTIA) certification, the A+, Microsoft Windows and the Cisco Certified Network Associate (CCNA) certification among others. 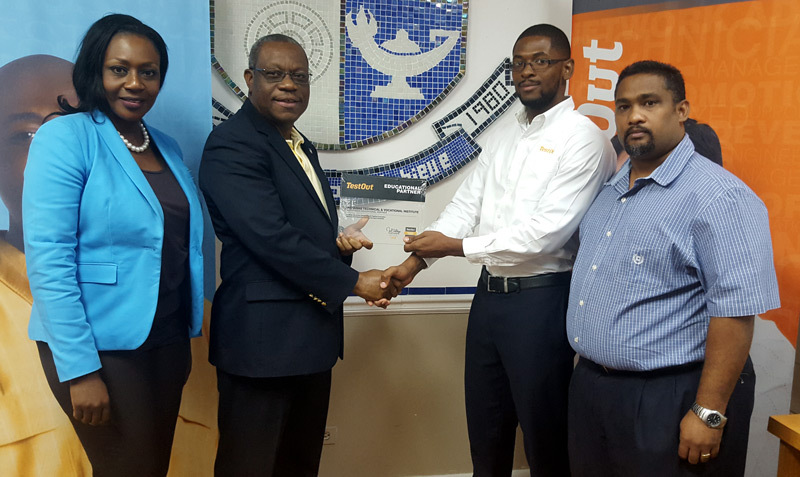 Shown here from left to right are BTVI’s Dean of Academic Studies, Pleshette McPhee; BTVI’s chairman, Felix Stubbs; TestOut Caribbean Training Consultant, Dervon McKellop and BTVI’s Information Technology Head of Department, Anthony Ramtulla.